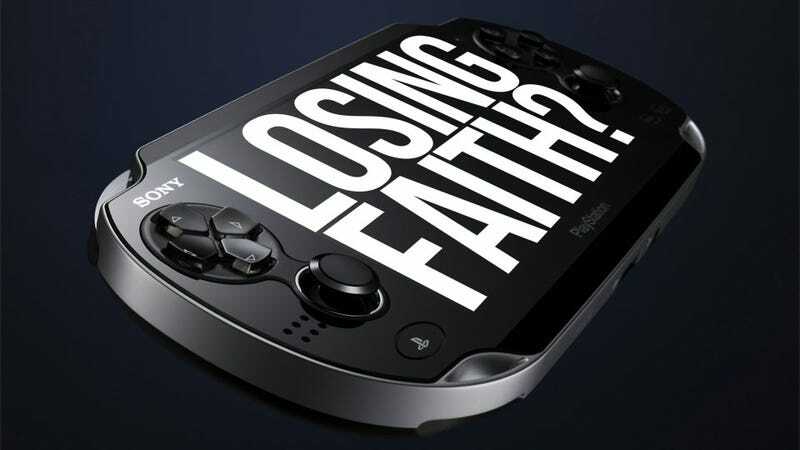 Should Sony be Worried About the PlayStation Vita? Maybe it Already is. Despite the fact almost every games writer I've ever spoken with loves the thing, the general public has, so far, not exactly warmed to Sony's latest handheld video games console. In Japan, sales have been dire. After a strong launch weekend, the Vita now isn't just being outsold by the 3DS, it's being outsold by the handheld it's meant to replace, the PSP. That's...not great. Still, it sounds familiar, no? Nintendo's 3DS suffered a woeful launch last year, when it was over-priced and lacking in quality software. The company was forced to act and act drastically, slashing the handheld's price in a move that was initially condemned (by the press, of course, not consumers) as Nintendo panicking. Yet last week Sony almost went one better. The PlayStation Vita isn't even out yet in the West and already its launch offerings are being changed. Two new bundles are being offered by Sony, one an upgrade to existing pre-order customers (that includes 250MB free data and a free PSN game) and the other a brand new deal which throws in both of the above as well as a free 8GB memory card (usually $45, but which itself has been cut to $35). Tellingly, both apply to the 3G version of the handheld, which with its AT&T contract in the US doesn't exactly seem to be exciting too many consumers. If sweetening the deal just after launch is panicking, what's it called when a company feels compelled to do it before a handheld is even released? A pretty good deal for customers interested in picking one up, for one, but in terms of the big picture it shows Sony might be more than a little concerned the Vita's stalling sales in Japan will carry over to the West next month, especially for the 3G version of the handheld.